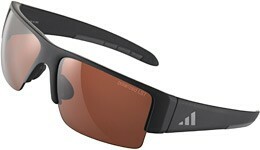 Adidas enlisted the help PGA Tour pro Justin Rose to design these stylish sunglasses designed specifically for the links. The style is pretty cool, but they also have some cool technology. The double-snap nose pad is more comfortable than your typical plastic sports glasses. Have you ever been looking for your sunglasses while wearing your sunglasses? Of course, this has never happened to somebody as brilliant as me, but if was going to happen to me, it might with these glasses because they are extremely light, and you can barely feel them on your face. These sunglasses hug your face, incorporating a traction-grip temple doohickey. But they don't put pressure on your face like a lot of cheap glasses do.